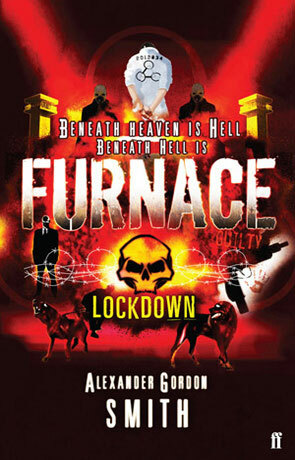 Furnace: Lockdown is a young adult science fiction novel and is the first volume in the Furnace series, written by Alexander Gordon Smith. Alex is just 12 years old when he is framed for murder and is sentenced to spend his remaining days in Furnace. Alex and his fellow inmates (some innocent, some cold-blooded killers) must find a way to escape before they are dragged screaming from their cell by giants, to return a scarred, twisted, gibbering wreck craving for blood. Overseeing it all is the Warden, a man as cruel and as dangerous as the devil himself, whose unthinkable acts have consequences that stretch far beyond the walls of the prison. As Alex begins to plan the biggest prison break in the history of prison breaks, he starts to uncover the true deeper, darker purpose of Furnace, a secret hidden from the world, a secret he must expose at all costs. This novel marks quite a break from Alexander's previous books and is clearly aimed at a slightly older audience (12+). I must admit to being quite impressed by the detail that goes into this novel, the back story is great and told both clearly and intelligently. The novel has really impressed me with a well told plot and engaging characters, Alexanders genius lies in creating a likeable hero from a kid who is basically a bully and a rogue and it takes the horror of the Furnace to reveal his redeeming qualities. Written on 1st April 2009 by Ant.